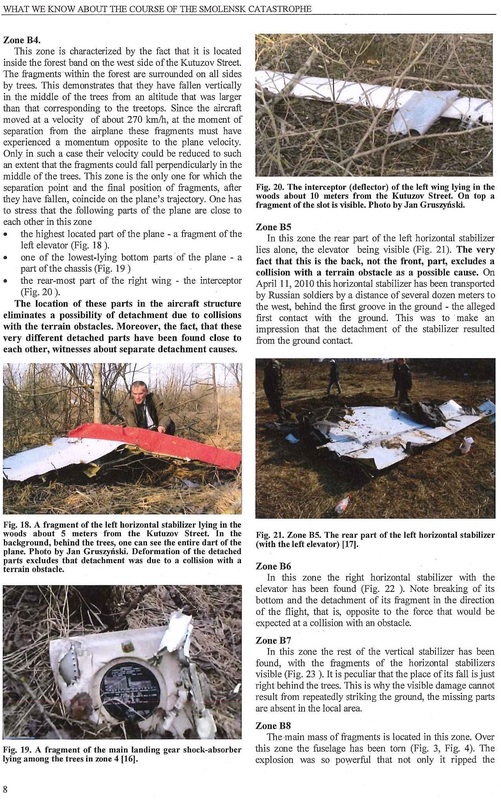 What we know about the course of the Smolensk crash? 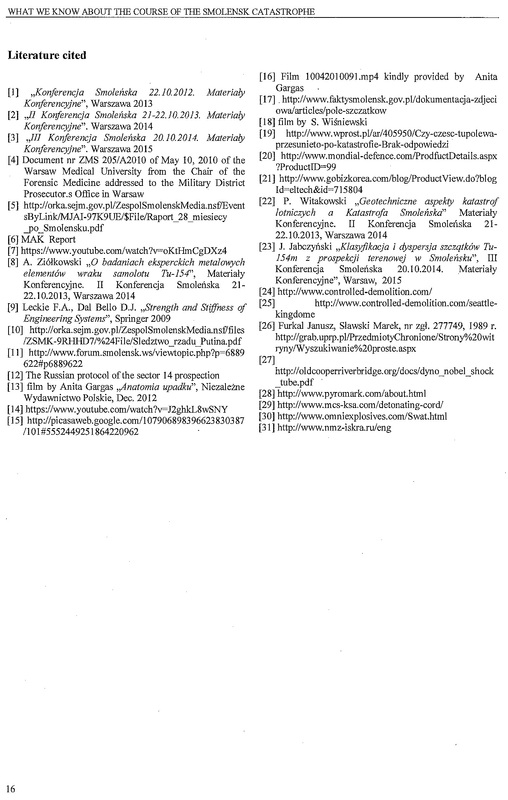 Findings of the Organizing Committee and the Scientific Committee of the Smolensk Conferences. 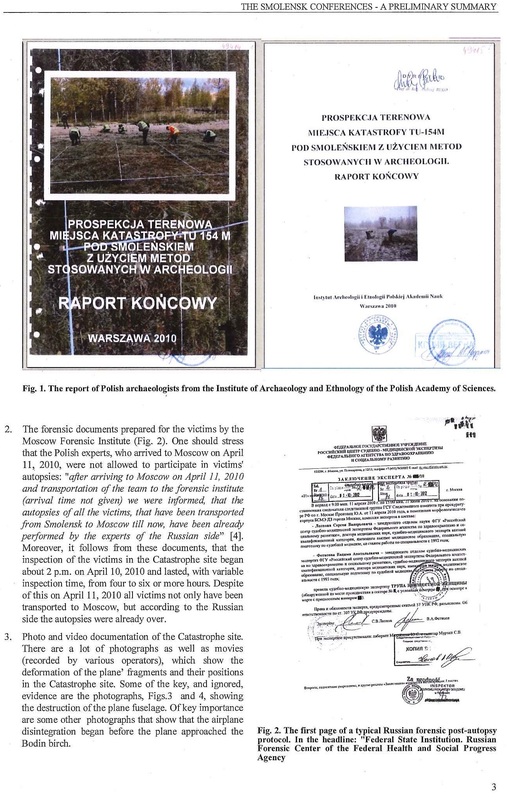 Between 21st-22nd October 2013, Warsaw hosted a two day conference on the Smolensk plan crash, with the participation of academics, scientists, experts and relatives of the Smolensk plane crash. The first Smolensk conference of this type was held on October 22, 2012 in Warsaw. Both conferences were initiated and financed by Polish academics, and both were attended by scientists, academics and experts from a wide range of fileds; presenting their cases in respective fields. 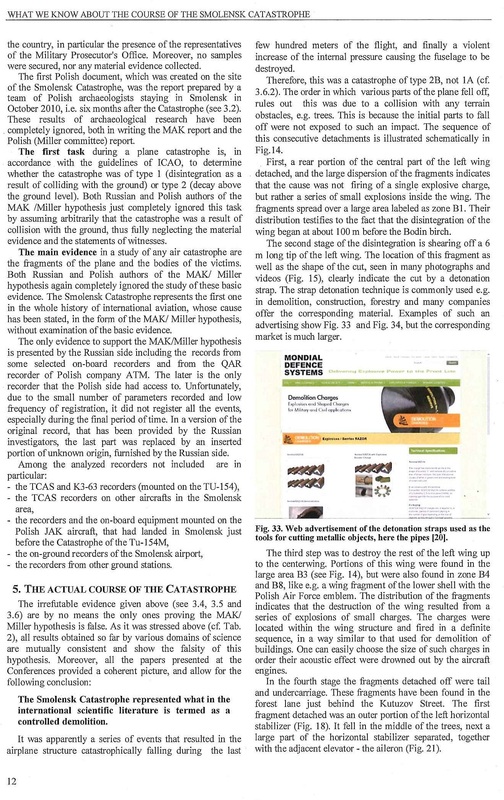 The second Smolensk conference brought forward findings, pointing to the fact that the Smolensk crash has been far from thoroughly explained, with researchers and academics expressing their doubts concerning the official version of the crash during a two-day session. The two day conference including discussions, four sessions, 30 submitted papers, speakers from Poland and around world, and the 49 member Scientific Committee - portrays the impressive initiative of the Polish scientific community. Unfortunately, the conclusions drawn from instances of individual speakers are appalling. 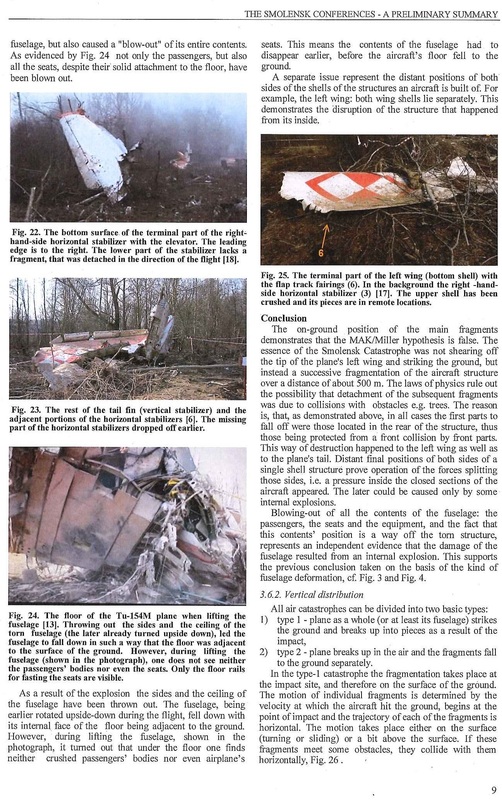 These indicate that the TU154M aircraft with 96 Poles on board was destroyed by explosions and that the official Russian and Polish governmental investigations of the disaster from the very beginning were nothing short of a scandal. Below please find the full report. 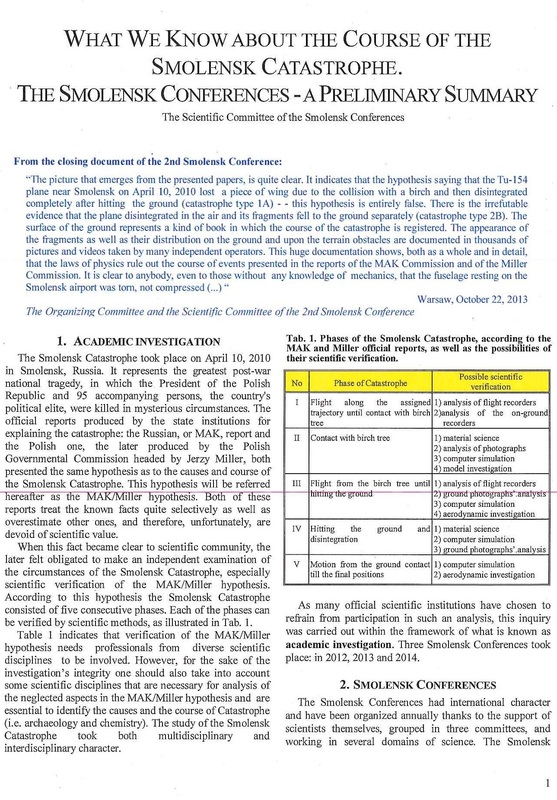 The scientific results of the three Smolensk Conferences 2012, 2013,2014 are related to all disciplines represented in the Scientific Committee. A particular emphasis was on sciences and technology, but non-technical domains such as medicine, sociology and law were represented as well. 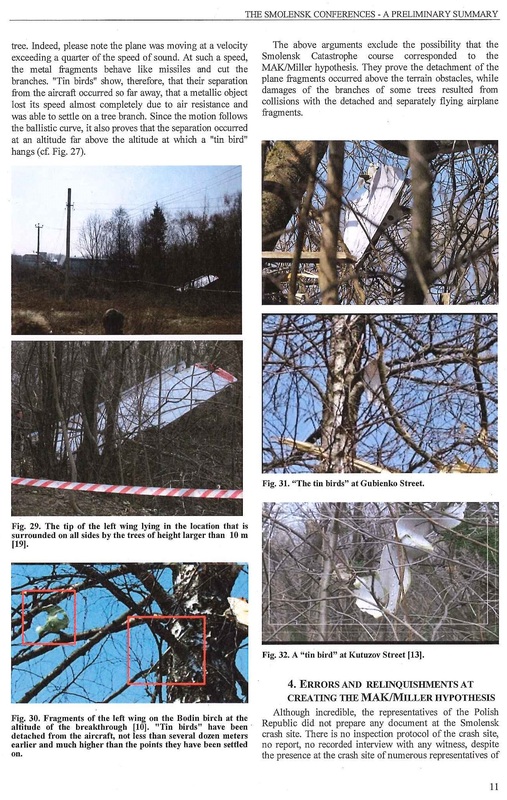 The Conferences allowed for examination of all available evidence and information concerning the Smolensk Catastrophe. 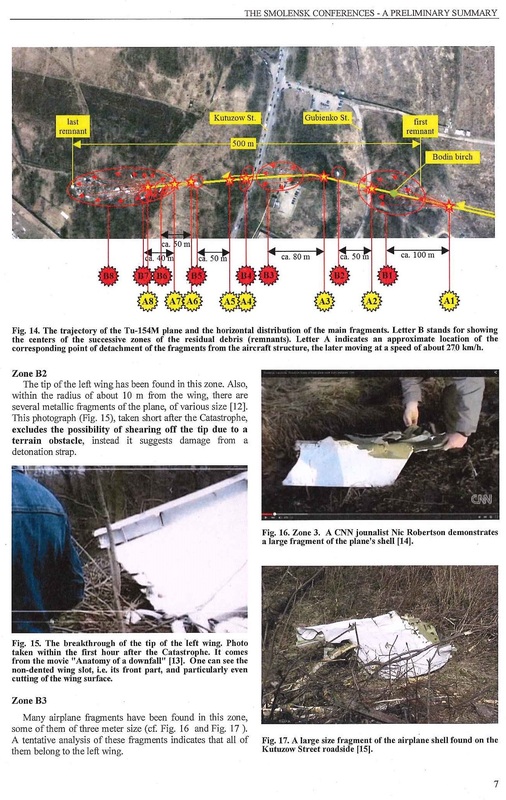 Usually a catastrophe investigation team needs additional assistance of external experts representing those domains of science, that are not represented among air-safety investigators. 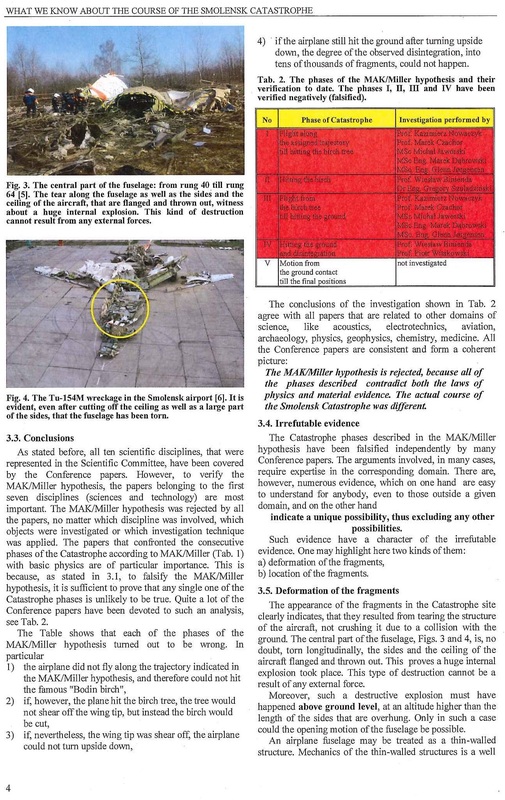 The Smolensk Conferences had no problem with this, because the Committees of the Conference, in particular the Scientific Committee and the Advisory and Inspiring Committee incorporated specialists from all branches necessary in such investigation. 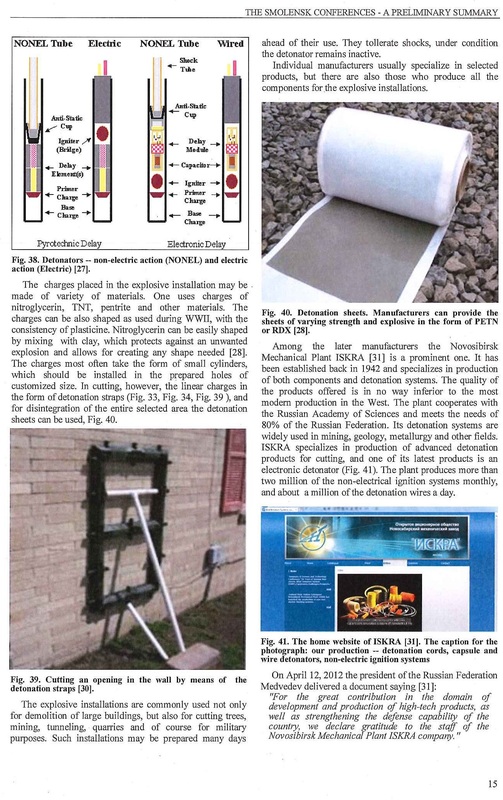 This scientific versatility, offered by the Committees as well as that represented in 78 presentations delivered from all the related domains, enabled the complex investigation of the available evidence and information. 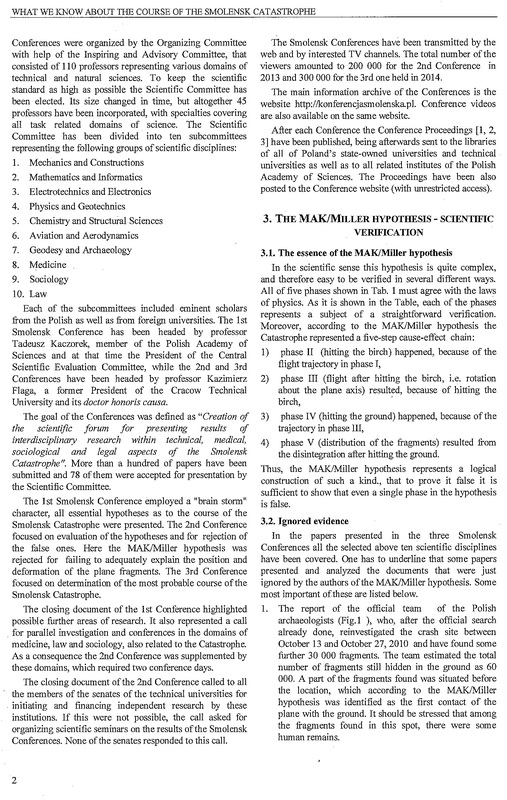 The conclusions of the Smolensk Conferences that can be drawn from the various domains of science are consistent and mutually confirm each other. These domains include: geodetic survey, geotechnics, archaeology, medicine, physics, chemistry, mechanics, aerodynamics, electric technology, acoustics. All the corresponding papers presented at the Conferences produce a coherent picture and allow to draw the following conclusions. 1. The MAK/Miller hypothesis is not supported by the evidence, since each of its five phases contradicts the laws of physics and irrefutable evidence. 2. 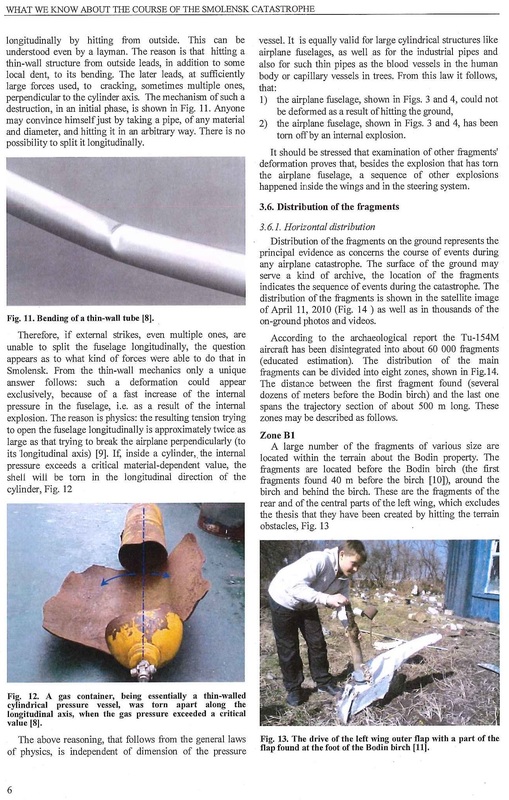 The Smolensk Catastrophe represented, what in the scientific literature is known as a controlled demolition, and has been carried out by a series of explosions, which took place in closed plane profiles, not available for pyrotechnic inspection. 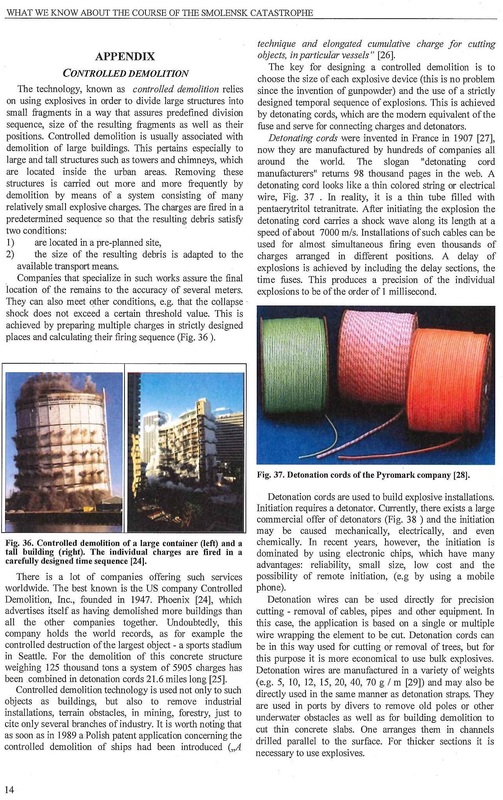 Some basic information concerning controlled demolition are provided in the Appendix. 3. 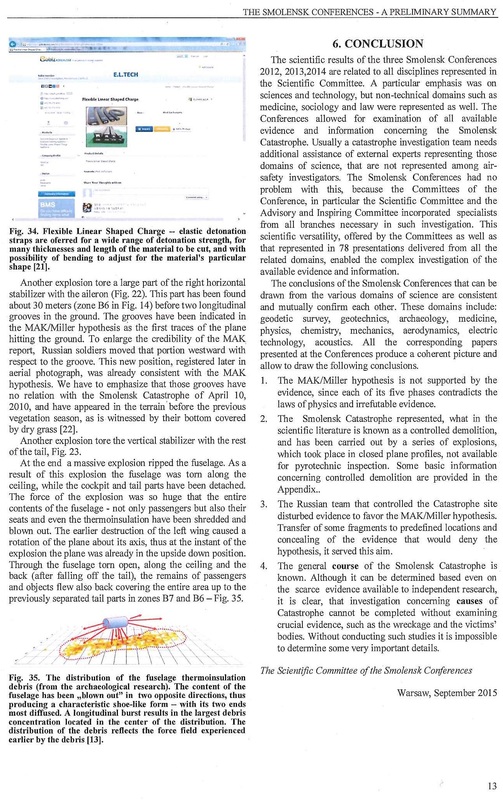 The Russian team that controlled the Catastrophe site disturbed evidence to favor the MAK/Miller hypothesis. 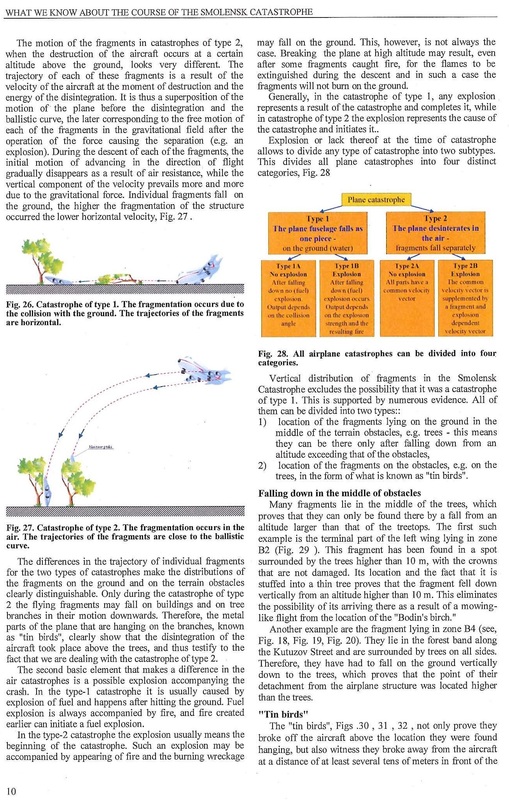 Transfer of some fragments to predefined locations and concealing of the evidence that would deny the hypothesis, it served this aim. 4. The general course of the Smolensk Catastrophe is known. 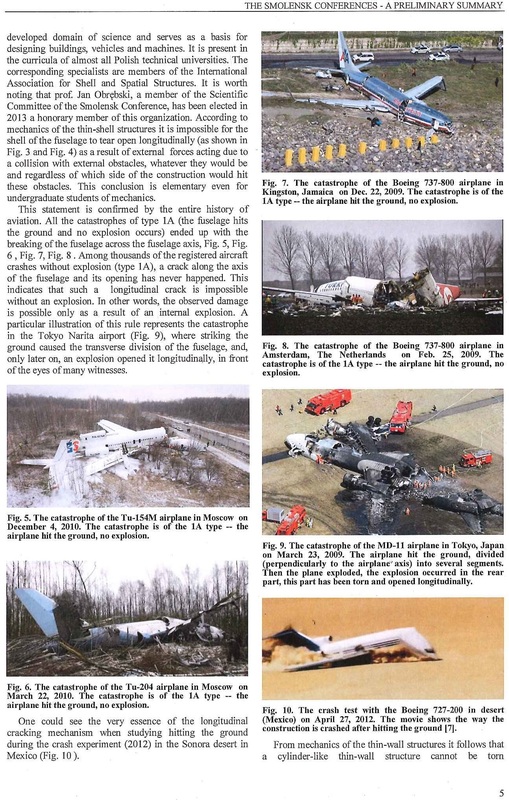 Although it can be determined based even on the scarce evidence available to independent research, it is clear, that investigation concerning causes of Catastrophe cannot be completed without examining crucial evidence, such as the wreckage and the victims’ bodies. Without conducting such studies it is impossible to determine some very important details.